It seems to be getting longer each year – time was when the hordes would descend on sleepy Pilton on a Friday, jumping right into the performances before the tent pegs had been driven in. These days virtually everyone is settled in by Thursday morning. Those who couldn’t take the time off work trudged in fearfully late, knowing they would have to find space a mile away or face the worst – camping almost on the paths where people fell into your tent in the night or by the toilets. I need not even describe the folly of the latter. So there we were, leaving Bedford on Wednesday morning at 7am. Even then it was a seven-hour drive including a two hour wait to get into the site. As a result of all this, by the time you see your first band you’ve been there two days and almost forgotten there is even music coming. Some serious overnight rain on Thursday turned the ground into a sticky mudfest, reminiscent of two years ago, but thankfully the weather turned on Friday, sunscreen was applied and the first band were ready. Personally, I find it all very physically demanding. It’s easier for some people than others and it’s hard not to feel a tinge of envy toward those who sail through it, sitting in blazing hot sun all day without so much as a batted eyelid. Unsuited to the outdoors as I am I don’t find it easy but my god, the rewards are great. As Friday had dawned and I remembered why we were there, the endlessly fun task of choosing what to see began. It’s quite an art and it’s all in the timing. I had read a little about the unusual stage show of Canadian band FUCKED UP and suggested that they be the first stop. To me their music is undeniably average but the show really lies with their delightfully named frontman Pink Eyes. A bald, but otherwise hairy, anarchist built like a tank, there was no doubt that he was THE show. Crowd surfing on brave shoulders he made his way to the back of the John Peel Stage tent and then forward again. A fun way to start the day. I should say at this point that I’m not a fan of dance music. I understand it, what the genre gives and means, but I like songs and that isn’t going to change. They don’t have to be short, I can sit and listen to a jazz piece that lasts an hour without a break, but there is variation in that. An endless beat is not for me. In the course of the weekend there were various trips to the dance tents to catch THE EGG, BANCO DE GAIA and others. It reminded me of the true essence of the festival; there truly is something for everyone. And everything that Glasto does, it does very well. Specialists in each genre are present, whether that be comedy, art, poetry and music of acoustic or electric (or electronic) base. It would be impossible to come away from Somerset feeling unsatisfied in any way. A stroll to the Pyramid Stage and we were confronted by the unbilled but very welcome Pharrell Williams and his band N*E*R*D. On late and with poor sound he did his very best to put on a good show but a touch of self indulgence told in the end. Knowing he had 5 minutes left, whether that is fair on him or not, he should have skipped to the last song and given the crowd what they wanted to hear. Instead he attempted a different, lesser-known track, and suffered the ignominy of being cut off as the music was faded out. The crowd booed. I felt sorry for him because the band are hugely enjoyable but this event is about how the individuals gather to form the collective. You do your thing and make way for the next band. You don’t stand up there slagging off the organisers and saying you’ll play on as long as you like. No you won’t, they have the volume control. He put on a good show while it lasted. Not that the organisers get it right absolutely all the time and an example of this came next with the marvellous FLEET FOXES. Wrongly placed on the Pyramid they sank in the chatter of the afternoon sun. Songs of beauty lost. Everywhere except the Pyramid, people are open and listening. At the Pyramid it’s play your hits and get off, whether you’re a legend or not. You get that booking, you know what you must do. With one album and one EP under their belts the biggest stage was not their place. Fleet Foxes would have been one of the acts of the festival at the Other (the second largest) stage. As it stood, they couldn’t make it work. It was time to avoid Lily Allen so off we went to the Jazz World stage to see Manchester duo LAMB fronted by the enchanting Lou Rhodes, not the last magical female singer I would see that weekend. Then it was back to the Pyramid for the rest of the night. I had seen THE SPECIALS on Later… recently and been hugely impressed, so I was very much looking forward to their performance. The band are superb, the songs are well known and the crowd got right into it. 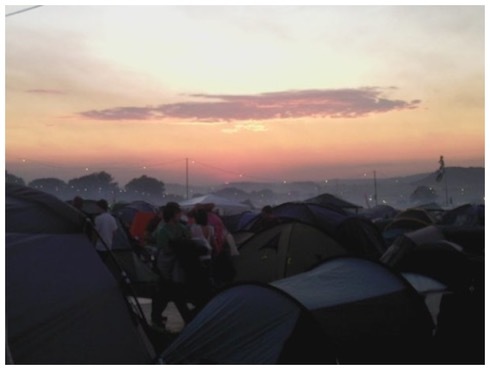 It was the first classic Glasto performance of the weekend, closely followed by the second – headliner NEIL YOUNG. Having grown up with his music ringing around my ears at home I was no novice but I had, in fact, never seen him live before. I’d even had tickets but the show had been cancelled, several years ago. I’ve been seeing gigs since I was a teenager. I’ve travelled to a dozen cities in seven countries to see artists play. I’ve seen shows in stadia, arenas, theatres, clubs, outdoors, basements… and what I witnessed was simply one of the greatest live performances I have ever seen. The superlatives have run out – charming and eccentric, his voice sears through you and both fills and breaks your heart and his guitar playing rips into your perception of what you thought music could give you. The songs, whether well known or not, are performed with such ferocious intensity or delicate heartbreak you just can’t even comprehend that you’re sharing the same space as him, that these gifts are finding you. He did it on his terms and the whole place fell to its knees. We staggered away slowly, the music spinning around our heads. Back to camp, a little fire built, a post mortem then bed. The first day of music was over.